Hamby Home(in)stead ...: Kissing Chooks! Although the Seven Hills Farm site stated they wanted to find "loving" homes for some of their older chickens, I'm sure kissing was not a requirement! Vaughan has been kissing our new arrivals though and cuddling them also - you just can't get more loving than that! 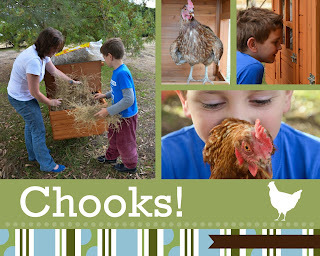 Obviously, our chooks have been welcomed with much excitement and are bound to be thoroughly indulged. Vaughan even caught them crickets as a special treat - and the girls were very appreciative of his efforts! We had thought that two or three chooks might be a good number for our coop however we were given four, effectively one each for all of us. At this stage we have named three of our new arrivals - Princess Fiona, Judge Judy and Jo. By sheer chance, Nick's chook is the fattest. I have suggested BFC (big, fat chook) as a possible moniker, but he has not yet decided on her name - although Chicken Lickin' was mentioned!